FYI: (a) Pattern numbers indicate each pattern’s position in the alphabetical set of patterns. (b) The colored oval symbols are variations of the co-intelligence symbol (described here) used to identify the category to which each pattern belongs. 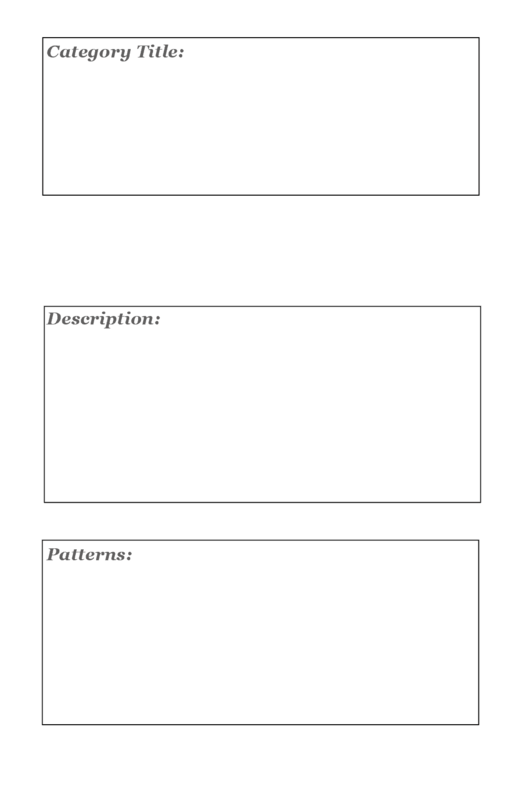 These appear on the pattern cards and the site’s individual pattern pages. Intelligence is how we maintain a semblance of understanding of and appropriate engagement with relevant realities and energies present in our complex, changing world. So tap into intelligence that is more than individual rationality. 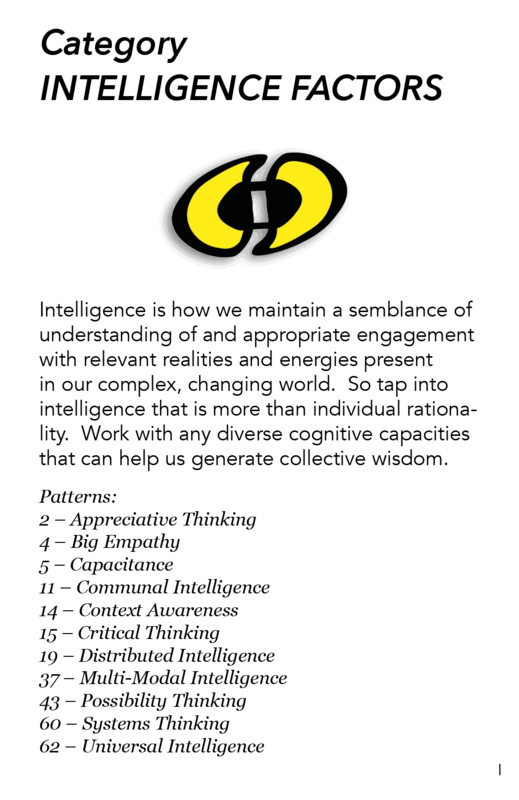 Work with any diverse cognitive capacities that can help us generate collective wisdom. 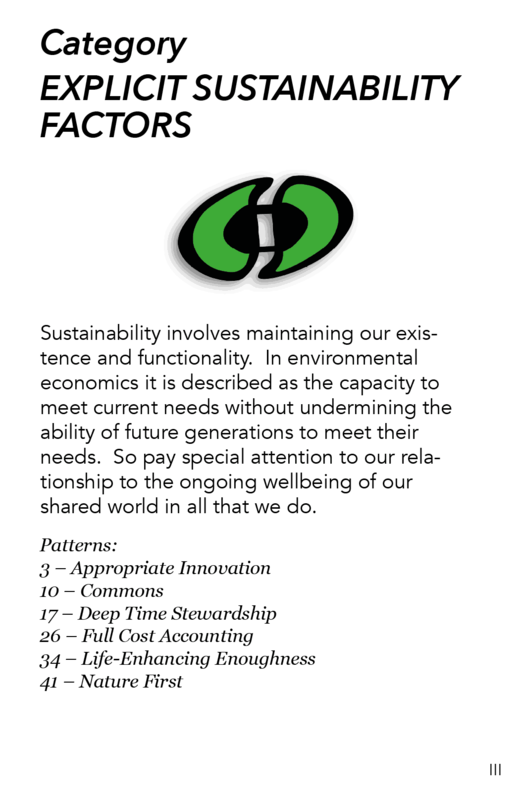 Sustainability involves maintaining our existence and functionality. In environmental economics it is described as the capacity to meet current needs without undermining the ability of future generations to meet their needs. So pay special attention to our relationship to the ongoing wellbeing of our shared world in all that we do. Institutions are the ways we have things set up. They are particular structures and practices, guidelines and expectations, that shape everything we do. And a political system is largely about such institutions. 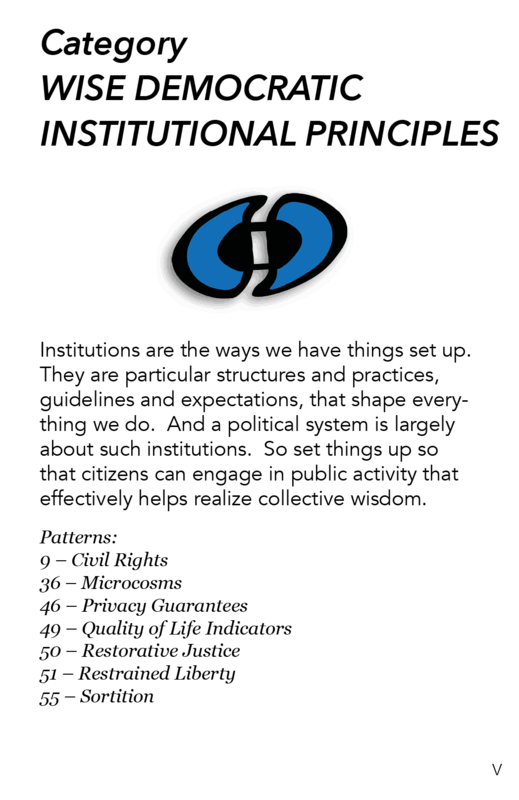 So set things up so that citizens can engage in public activity that effectively helps realize collective wisdom. In a wise democracy we know we are all in this together. 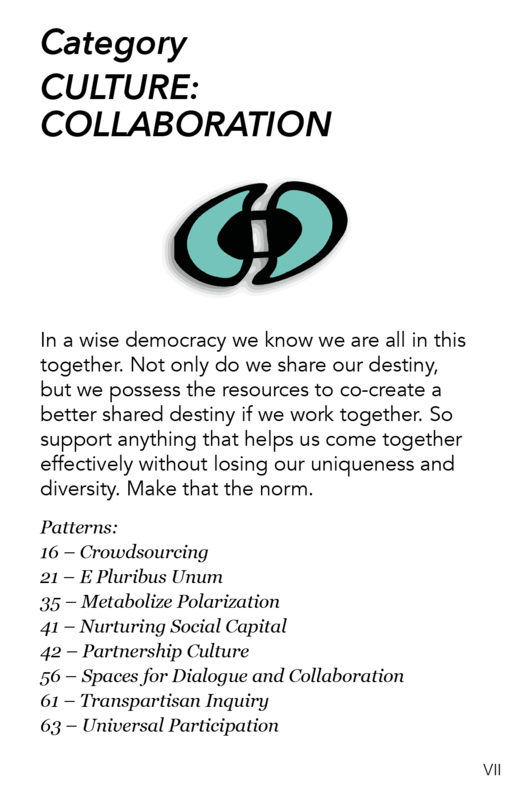 Not only do we share our destiny, but we possess the resources to co-create a better shared destiny if we work together. So support anything that helps us come together effectively without losing our uniqueness and diversity. Make that the norm. 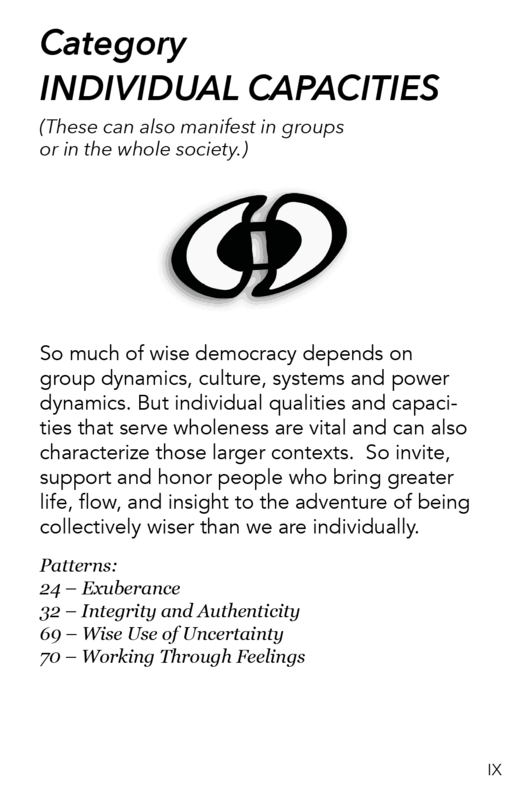 So much of wise democracy depends on group dynamics, culture, systems and power dynamics. 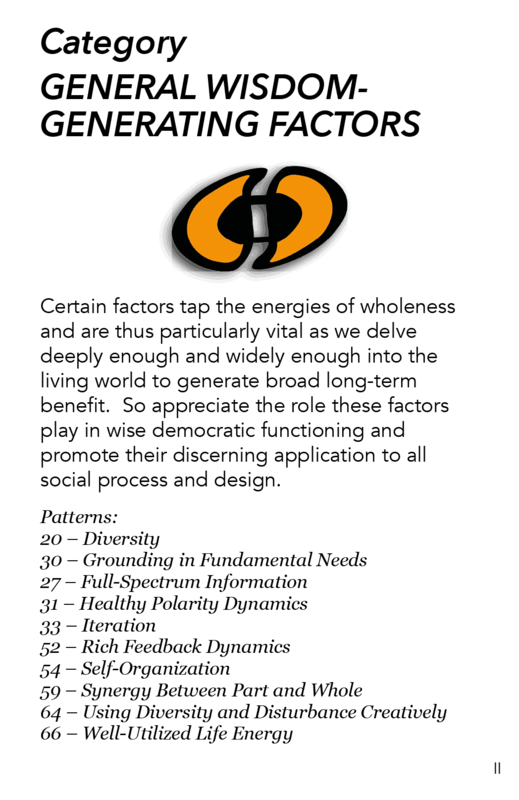 But individual qualities and capacities that serve wholeness are vital and can also characterize those larger contexts. So invite, support and honor people who bring greater life, flow, and insight to the adventure of being collectively wiser than we are individually. Certain factors tap the energies of wholeness and are thus particularly vital as we delve deeply enough and widely enough into the living world to generate broad long-term benefit. 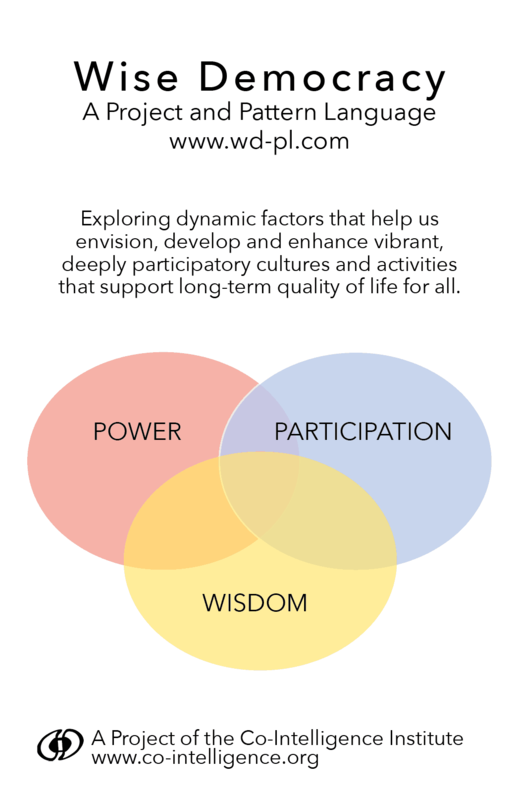 So appreciate the role these factors play in wise democratic functioning and promote their discerning application to all social process and design. Power shapes whatever happens. It is the capacity to do, to influence, to create desired effects. Democracy, like all politics, organizes social power. So promote the wise power of the whole with nuanced, wholesome power dynamics that take seriously traditional democratic power principles while reaching beyond them for even greater benign potency. 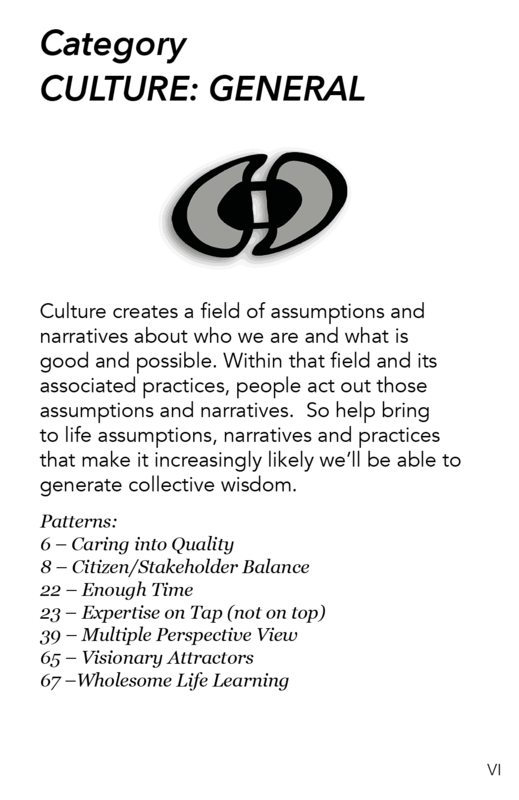 Culture creates a field of assumptions and narratives about who we are and what is good and possible. Within that field and its associated practices, people act out those assumptions and narratives. So help bring to life assumptions, narratives and practices that make it increasingly likely we’ll be able to generate collective wisdom. So much know-how exists about how to bring people together in groups that generate collective wisdom that serves them and their communities. So gain this competence, take it seriously, share it, and apply it in groups of all kinds, spreading it into the larger culture so it becomes expected and experienced in everyday life. To download the 9 category cards, an overview, and the complete Wise Democracy Pattern Language use the DOWNLOAD button. Many patterns could go in more than one of these categories. and, in each case, why it could fit there.